Kanto SUB6 - Subwoofer - 80 Watt - 6" - matte whiteBass you can feel. SUB6 is a sealed box front-firing subwoofer offering 200W of powerful bass extension. A precise low-pass filter makes SUB6 a perfect match with any Kanto speaker, allowing you to dial in the perfect cutoff frequency. Its 6" paper-cone driver enables true sub-bass reproduction with low-end that has real weight. Phase adjustment, power saving auto-off and full L/R line level input round out this compact package. SUB6 features a specially designed grille which protects the driver from impact and dust, while allowing sound through with minimal diffraction. SUB6's acoustic MDF enclosure is engineered to reduce undesired resonance and reverberation inside the box, providing clean, deep sound. 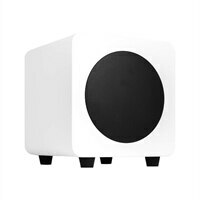 Although designed to be a perfect match with Kanto speakers, SUB6 features stereo inputs allowing use with any source. Anything from vintage stereo receivers to high-end amplifiers with stereo sub output can be connected, so you don't have to sacrifice quality for convenience. Bass you can feel. SUB6 is a sealed box front-firing subwoofer offering 200W of powerful bass extension. A precise low-pass filter makes SUB6 a perfect match with any Kanto speaker, allowing you to dial in the perfect cutoff frequency. Its 6" paper-cone driver enables true sub-bass reproduction with low-end that has real weight. Phase adjustment, power saving auto-off and full L/R line level input round out this compact package.